This is one of a small selection of original Georgian / Regency etched satirical prints that I have in my Etsy shop. 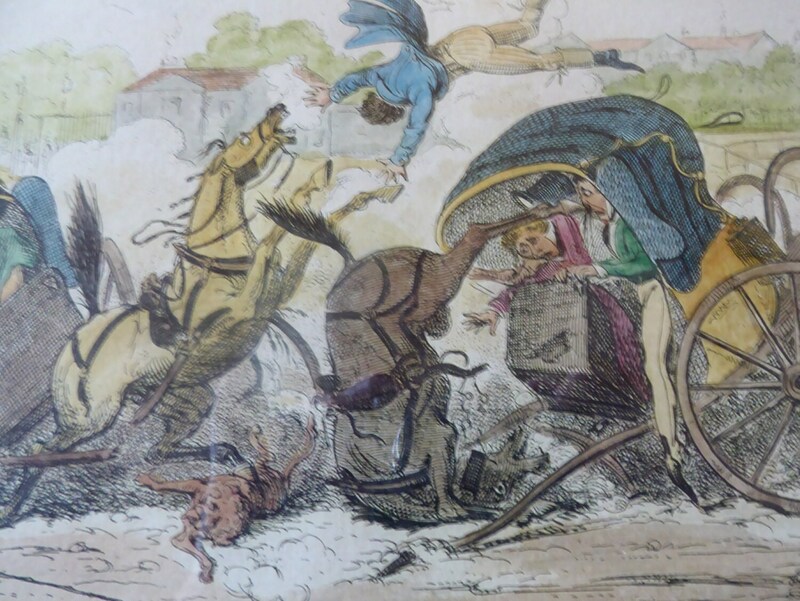 They are good quality items by George Cruikshank and originally impressions date from around the 1820s. My prints are slightly later antique re-prints from the original plates and these were all published by Thomas McLean for the second and final edition, 1835 (as annotated below). They are hand-tinted with watercolour. Each of my prints is identically framed - with a fine new & good quality frame and they are certainly ready to hang when you unpack them! The image is again a rather timeless one - and it shows an incident on a busy road - three carriages or cabriolets have been speeding along and not looking where they are going - and we see an almighty crash - horses pulling the cabs fall to the group and the fine ladies and gentlemen are shown flying into the air. Lordy me! What Ho! 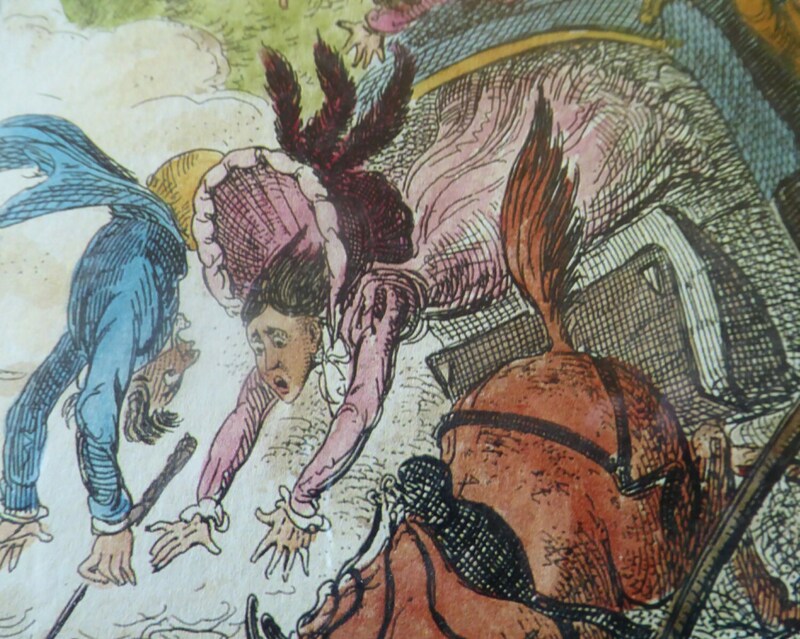 - A fine original print by Cruikshank lampooning modern Regency life. 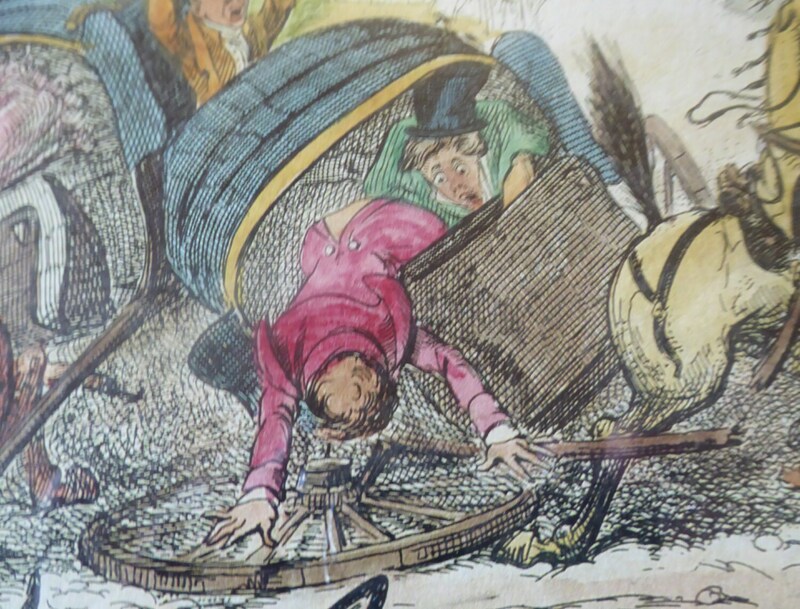 I think that the building in the background shows Kensington Palace in Hyde Park - perhaps with Cruikshank implying here that the Royalty under King George IV and his extravagant spending is soon going to come crashing down? 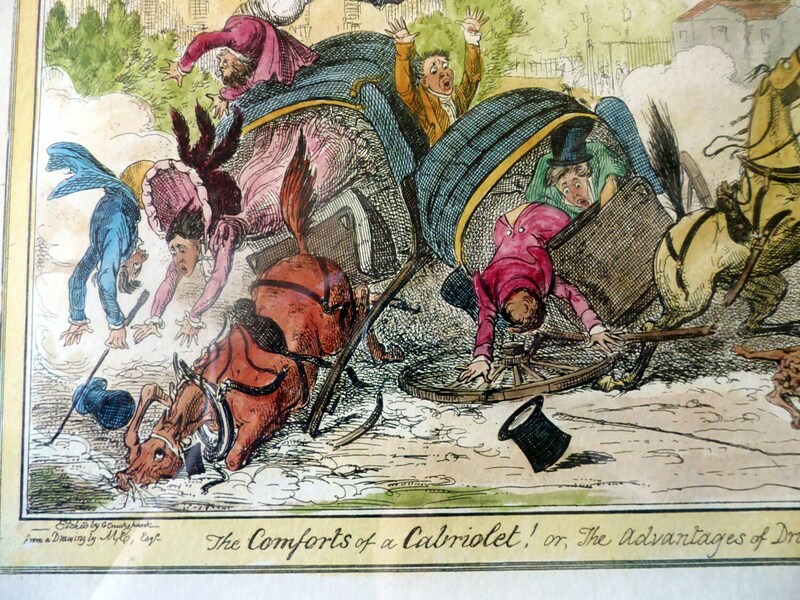 This print is signed below: Etched by G Cruikshank from a Drawing by MC Esquire / Pubd By Thos. McLean, 26 Haymarket, Aug 1835. It is in excellent condition - with no nasty condition issues to the sheet etc. It is in a fine Hogarth style black and gold frame - and recently re-mounted with a good quality double mount - it is certainly all ready just to hang on your wall. More images can be provided on request to show the frame etc. I have four prints on offer - and would offer good postal discounts if you would like more than one. My price is indeed a very fair price for this interesting Regency print - and also given that they are currently all so beautifully presented. George Cruikshank ( 1792-1878) was taught the art of caricature by his father, and he quickly became a favourite satirist and illustrator in Great Britain. He illustrated many of Charles Dicken’s books and published his own George Cruikshank’s Magazine. Early in his career, he withdrew from political satire, instead focusing his efforts upon the dramatic social scenes of the day. By the end of the 1840′s, Cruikshank was firmly involved in the temperance movement, and he extolled that theme frequently in his artwork. 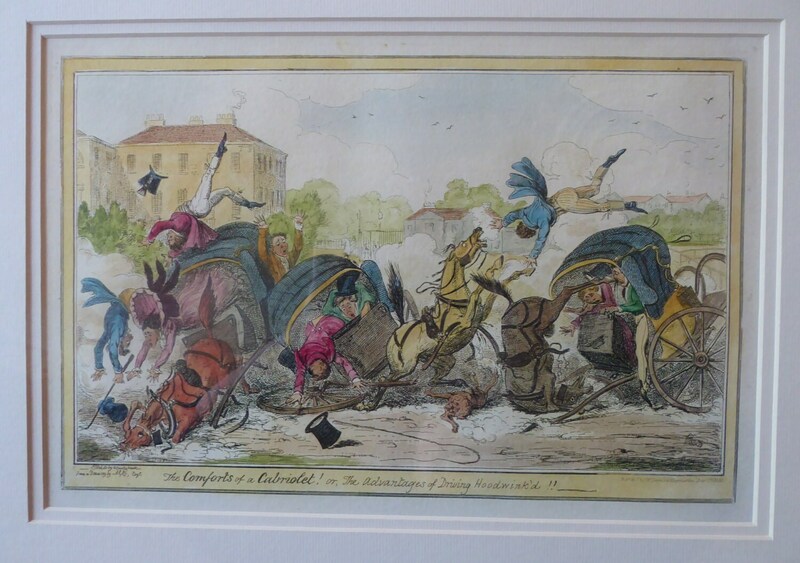 Please see my other Georgian Cruikshank etchings in my Etsy store. SADLY, UK POSTING ONLY FOR THIS ARTWORK.